A/C is the product that raised U.S national human productivity more than any other in the second half of the 20th century. More people could work in more places than ever across more of the climate extremes in a far more comfortable environment. But refrigeration A/C is a power hungry method to dry and cool air – even engineered as a heat pump; A/C is a large part of the electric grid’s load. The U.S. Department of Energy’s National Renewable Energy Laboratory has invented a new air conditioning process for the 21st century with the potential of using 50 percent to 90 percent less energy than today’s top-of-the-line units. It uses membranes, evaporative cooling and liquid desiccants in a way that has never been done before in the centuries-old science of removing heat from the air. Kozubal and DEVap Memebrane. Click image for more info. Cooling comes in two forms – sensible cooling, which is a temperature drop, and latent cooling, which comes from pulling the moisture out of the air. One intriguing product already on the market in arid, temperate climates is the Coolerado cooler. It differs from a typical evaporative cooler by never increasing the moisture content of the supply air. It provides cool air through indirect evaporative cooling. Indirect evaporative systems use a purge air stream that removes heat from the product or supply air stream that is then directed into a building. The Coolerado method can cool the air all the way to the wet-bulb temperature, the lowest temperature to which air can be cooled by evaporating without changing the pressure. “It’s a big improvement on evaporative cooling because it doesn’t add moisture and still gives you cold air,” Kozubal said. However, in a humid climate, the Coolerado does not provide cold air or humidity control. In a typical evaporative cooler water flows over a mesh, and a fan blows air through the wet mesh to create humid, cool air and they are a lower-cost alternative to A/C in dry climates that don’t get too hot or humid such as Denver, but Miami is too humid and Phoenix is too hot. In high humidity Miami adding water fails, as the air cannot absorb enough water to become cold so the air creates a hot and sticky building environment. At high ambient temperatures known in Phoenix, the evaporative cooler can bring down the temperature, but not enough to make it pleasant inside on a 100-degree day or during the four to eight week moist period known as monsoon season. The cooling bumps against the wet bulb temperature. The wet bulb temperature could be 75 or 80 degrees on a mid-summer Tucson day. But a typical evaporative cooler only can bring the temperatures about 85 percent of the way to the wet bulb level. The NREL’s DEVap solves that problem. It relies on the desiccants’ capacity to create dry air using heat and evaporative coolers’ capacity to take dry air and make cold air. Kozubal says, “By no means is the concept novel, the idea of combining the two. But no one has been able to come up with a practical and cost-effective way to do it.” HVAC engineers have known for decades the value of desiccants to air conditioning. In fact, one of the pioneers of early A/C, Willis Haviland Carrier, knew of its potential, but – smartly for his time – opted to go the refrigeration route. You will recognize desiccants as those little pouches of grains packed with new products to absorb humidity. 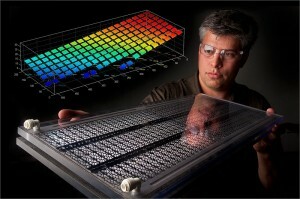 The kind NREL uses are syrupy liquids – highly concentrated aqueous salt solutions of lithium chloride or calcium chloride. They have a high affinity for water vapor, thus can create very dry air. Getting the humidity into a desiccant is easy, getting it out isn’t. Inventing a simple device for easy installation and maintenance is the barrier stopping desiccant cooling from entering into commercial and residential cooling markets. DEVap Cooling Block Diagram. Click image for more info. The NREL device solves the problem using thin membranes that simplify the process of integrating airflow, desiccants, and evaporative cooling. These result in an air conditioning system that provides superior comfort and humidity control. The membranes in the DEVap A/C are hydrophobic, which means water tends to bead up rather than soak through the membranes into the dessicant such as the rain fallen on a freshly waxed car. That property allows the membranes to control the liquid flows within the cooling core. “It’s that property that keeps the water and the desiccant separated from the air stream,” Kozubal said. Kozubal explains, “We bring the water and liquid desiccant into DEVap’s heat-mass exchanger core. The desiccant and evaporative cooling effect work together to create cold-dry air.” The air is cooled and dried from a hot-humid condition to a cold and dry condition all in one step. This all happens in a fraction of a second as air flows through the DEVap air conditioner. The result is an air conditioner that controls both thermal and humidity loads. DEVap is expected to use 50 to 90% less energy than top-of-the-line refrigeration-based air conditioning. DEVap replaces the refrigeration cycle with an absorption cycle that is thermally activated. It can be powered by natural gas or solar energy and uses very little electricity. This means that DEVap could become the most energy efficient way to cool your home or business. With a patent application in progress NREL’s Kozubal expects that over the next couple of years he will be working on making the device smaller and simpler and perfecting the heat transfer to make DEVap more cost effective. 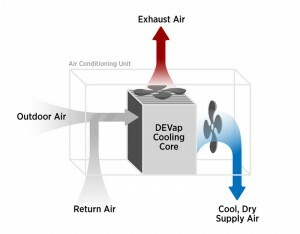 The NREL wants to work with manufacturers to bring DEVap to market and create a more efficient and environmentally benign air conditioning product. Sometimes government research looks very, very good. One has to wonder with the gauntlet now thrown down what the leading A/C makers will do. If Kozubal gets to saving 90% of the energy used now having a license would be a very competitive idea. This is something to watch for. Having the freshly released petrol spills, the requirement for a replenish-able power resource is increasing. Just how do you propose we get alternative power or modify our solutions of extracting and utilising energy today? This new model of air conditioners is definitely worth looking into. Its ability to save energy is the greatest advantage. air conditioner is always a necessity at home’`. This site seems to get a great deal of visitors. How do you advertise it? It offers a nice individual spin on things. I guess having something useful or substantial to give info on is the most important thing.